I will do a full match review tonight or by Saturday, but in the meantime I thought I'd start the process by posting the basic info and some links to photos and video. I must admit to being rather nervous about this game. Because this is pretty much it. At this time, we don't have any other friendlies scheduled between now and the announcement of the World Cup Japan national squad to take place in mid-May. C'mon Nippon, show us something inspiring, give us some ray of hope to hold onto until June! Yesterday's NT practice was mostly the team going over set piece strategies and defense, as is the usual tradition. According to Zico, the sudden switch to the 3-back system was because Endo withdrew from the squad -- Zico liked the option of switching to 3 from 4-back, and putting in Tsuboi, instead. Ono was not kicking free kicks during practice because he felt some vulnerability in his ankle -- not a good sign. As usual, I will aim to have a match report up this weekend. The links to goal clip streams have been added to the >>summary of the Round 5 J1 games. The links are embedded in the entry, under the respective game summaries. (Click pic to enlarge. Oita's Big Eye stadium can be seen in the distance.) A chilly and windy afternoon yesterday in Oita. 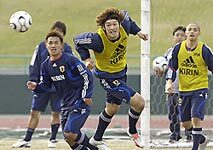 The team, now joined by Tamada and Kubo, but missing Endo (who has withdrawn due to injury to his thigh), played a practice game against a local high school team. 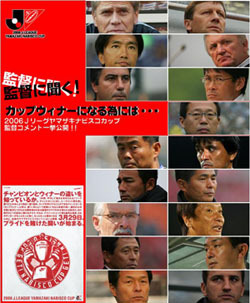 Zico surprised players by suddenly informing the team there and then that they would play 3-5-2 system. A big surprise considering we had been 4-4-2-ing it for most of the recent games; plus it was important for the team to iron out the kinks in the 4-back system after things fell apart in the Bosnia game. Here are some bits and pieces reported in the sports rags. 3 defense: Nakazawa - Miyamoto - Tsuboi. Miyamoto was reportedly in a grumbling mood after the game, apparently displeased with the way the defense line performed. He claimed there was too much distance between the defenders. Miyamoto has had a slow start to the season, being off the starting squad for Gamba in the first four games -- after Monday's training session, he remained on the grass after the others had left, to practice feeds with the staff. Reports say that Tsuboi showed stability overall, and I guess he has edged Tanaka out of the spot. Ono, who admits he is stil at about 40%, seemed to thrive in the 3-5-2 system. Claimed it felt like there were more people in front of him to pass to, and since he is a passer he set up many good plays. Tamada and Kubo started. Zico likes the idea of having two lefty forwards, and if both are fit enough, is planning on starting these two against Ecuador. In the practice game, they were awkward with each other, trying to get a feel for the other's movements. Though they did try some one-touch zigzagging moves. But very little interaction between the two, and did not look effective. In the second half, (40 min halves) Zico substituted nine players in, but the change that attracted comment was pushing Tamada down a line to play as an offensive half. From here, he fed many good balls into the two forwards Maki and Sato. Tamada, who had not initially intended to play the full game, ended up playing the whole 80 mins. Although it does sound like an added option in theory, in the end it just means we have one more forward who actually can play better as a midfielder....sigh! As for Zico himself, he has been uncharacteristically avoiding detailed questioning from the press, and has not uttered any comments in response to news about Yanagisawa's injury. Insiders say that he was extremely saddened by the Yana news. He avoided commenting altogether on Monday, and on Tuesday rushed past the press while making jokes that it was too cold to move his mouth. I am always intrigued by the way Zico behaves/responds when it comes to his players; especially when something bad happens to any. There's a fierce sense of loyalty and emotion. Thursday's Ecuador game is reported to be sold out already, and as it is a holiday, the city expects a nice surge of agme-related tourist activity. 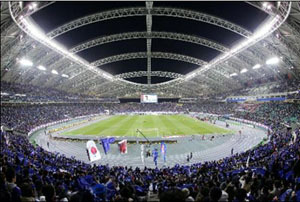 The National Team gathered in Oita Monday (yesterday) to begin practice ahead of the Kirin Challenge Cup friendly against Ecuador that will take place on Thursday night. Like Francefan mentioned in a previous comment, Kashima forward Atsushi Yanagisawa is indeed out for about 2 months. The club doctors and Yana himself are putting on an optimistic/brave face, saying that it isn't impossible to heal this injury (Yana has elected to operate on the injury) in 6 weeks. Luckily, this bone fracture was not a stress fracture (like Ono's last year), which means that the possibility for a better/faster recovery are higher. It is really unfortunate for Yana, since he did come back to the J league in order to play more and prepare for the World Cup. With about 74 (?) days left until the World Cup begins, I'm sure all players are treading that fine line between playing really hard and not wanting to get injured. No player has been called to replace Yana's open spot. Zico had mentioned that he is looking forward to seeing the DragonBall duo (the "Tatsu" of Kubo's first name means "dragon"; and the "Tama" of Tamada means "ball") up front. However both players were a no show at the practice grounds. Both players due to some form of fatigue. I understand Zico's sense of expectation -- this duo has played together in 5 games, but in all these games they got results. But right now, if I were to have to choose, I would not use Kubo or Tamada. It is rather sad that after all the hubub of Zico announcing 5 forwards to the squad, we end up with 2 on the first day of practice...! :( But both Maki and Sato are apparently keeping the competition tight. Personally I think a Maki/Sato pairing would be interesting to watch. Both have been scoring for their clubs, and both are obviously more fit and ready for the game. Though they are at the bottom of the totem pole, I think they deserve this chance to start. I mentioned before that since FIFA is not going to allow a second person (translator) into the technical area during the World Cup, countries like ours where the players and the manager speak different languages would have to adjust fast. Well, Zico apparently has. In yesterday's practice sessions, Zico was out on the pitch with the players sans translator Suzuki. And he was seen shouting directions to the players in both Japanese and Portuguese. The players are not unfamiliar with Portuguese, since almost every club has a Brazilian player or two or three (plus managers and staff) in it. And translator Suzuki has shared with the press that Zico actually can speak conversational Japanese no problem. But his policy up until now has been to rely on the translator because he wanted to be able to communicate at a more sophisticated level, with more acuracy in detail and nuance. Now Zico is changing that rule in anticipation of being translator-less during games.